Whom should I contact to arrange a burial? Which funeral homes can assist me with arrangements? In Mount Vernon, Dowds-Snyder Funeral Home is not practiced in Jewish funeral traditions but can provide basic Jewish funeral arrangements. In Columbus, Epstein Memorial Chapel practices Jewish funeral traditions and customs. JCS has met with representatives from both of these facilities, and they are familiar with our cemetery. Who can officiate at the ceremony? In Knox County, Kenyon’s Jewish chaplain Marc Bragin can officiate. Epstein’s can arrange for a rabbi from Columbus. Where can I hold a reception locally following the burial? The cemetery is adjacent to Quarry Chapel, a lovely nineteenth-century church that has been deconsecrated and is available for private functions. Kenyon College has various facilities that are available on a limited basis. Where can I find information on Jewish funeral traditions? Where can I arrange for a headstone? In Knox County, Ralston Art Memorial can create monuments according to your design. 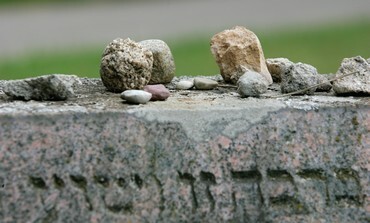 In Columbus, several businesses have experience designing headstones for the Jewish community. How can I find a synagogue in the area?